I was born in Weiser, Idaho, to a family in the cattle and sheep ranching business. We split our time between Weiser for the school year and McCall during the summer while our sheep were in the mountains. Our family still runs the ranching business. A Delta Gamma, I graduated from the University of Idaho in 1976 with a Bachelor’s degree in Home Economics Education and minors in Science and Physical Education. I taught high school courses in Hermiston, Oregon, the year following graduation. Brad and I married in 1978. Looking back over our 40 years of marriage, I am grateful for the opportunities I’ve had as a mother of two sons, homemaker and wife. There are unlimited opportunities for a willing volunteer. Over the years I have been a soccer coach, Junior Great Books discussion leader, Cub Scout leader, room mother, and PTA president. I have also volunteered as the Super Science Saturday co-chairman, National Geography Bee coordinator, Child Assault Prevention project member, Emmett fourth grade pioneer picnic co-chairman and originator, and Project Graduation chairwoman. My involvement with our broader community included membership on the board of directors of Friends of Four; board of directors for Idaho Public Television; board member of the Children’s Home Society of Idaho; president of the Congressional Award Council of Idaho; member of P.E.O. (Philanthropic Educational Organization); and organizer and past president of Friends of the Emmett Public Library. I am happy to help with the branding lunches and when it’s time to ship lambs from the mountain. I feel fortunate when I can be there for family or friends who need extra care and attention due to illness or other unexpected or expected life occurrence. I am grateful for the relationships and friendships I have fostered with many Idahoans during my lifetime. 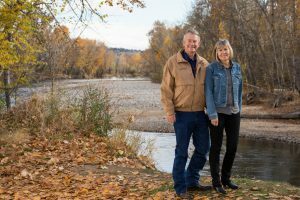 It is an honor to be Idaho’s First Lady, and I am exceedingly happy for the time and love we are privileged to share with our sons, daughters-in-law, five grandchildren, and extended family.